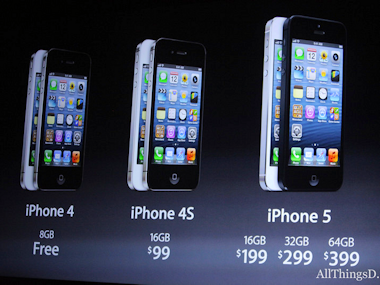 Verizon activated a record number of iPhones in the fourth quarter, about half of which were the LTE-enabled iPhone 5. Reporting fourth-quarter earnings Tuesday morning, Verizon said that, of the 9.8 million smartphones it sold during the period, 6.2 million were iPhones. So about two-thirds of new smartphone activations at Verizon were attributable to Apple’s smartphone. But while discussing the carrier’s latest earnings on a conference call, CFO Fran Shammo mentioned that “almost half” of the iPhones Verizon sold were able to tap into its 4G LTE network, meaning the other half were a mix of iPhone 4 and 4S. Over the past few quarters, Verizon has accounted for about 11 percent of Apple’s total iPhone shipments. If that percentage holds true for the holiday quarter as well, it could mean Apple easily met or surpassed consensus estimates for iPhone sales of 48 million. Indeed, a few analysts have already stepped forward to suggest that Apple might report a full-on iPhone blowout tomorrow. Jefferies analyst Peter Misek is calling for iPhone shipments of 53 million. Over at Topeka, Brian White says 51 million isn’t an unreasonable number, and a “greater than 56 million iPhone shipment number” isn’t beyond the realm of possibility. Apple reports earnings Wednesday after market close.